Advice: When to embrace vs. ignore? From my objective distance I wondered how this could happen? It seemed that she interpreted negatively some feedback to ‘broaden’ her idea that was offered by industry participants. Credible sources? Not sure. Biased? Almost definitely. The conversation got me thinking about how often this has happened to me. Unrecognized? Over the years, not just in transition, one of my life lines has been feedback from thinking individuals. Many times I embraced their advice wholeheartedly. Sometimes I adopted another’s view of me or my newest idea. Maybe I was wrong? Ever waded into this pool? Maybe Steve Jobs had it right. He acted on his heart’s passion without a care for the often negative advice he got from others. Maybe we need to comport ourselves like a well-functioning United Nations, taking in all perspectives and actually signing joint accords. Which side wins? When? Here is a funny story. Before accepting my last job I outreached to several advisors to get their opinion. The proposed job would cause me to move from technology industry P&L leader to HR executive in a large S&P 500 company. Practically neighbors, right? One conversation was a conference call with a technology muckety muck who knew me well. I started the call by outlining the quirky job offer that I had received. He listened politely. Then he delivered a zinger…. ‘Pink graveyard.’ So went his advice regarding my potential opportunity. Interesting. I’d never heard of the term before. He couldn’t fathom why I’d consider this…walking back from my hard-earned P&L fights in the technology arena. He listened as I told him that with two kids under two I didn’t have the energy to jump on airplanes to help my team chase a revenue number every quarter. I reasoned that HR/Admin gave me the only seat in the C-suite outside of the CFO without revenue responsibility. Somehow it didn’t compute at the time that with 21,000 employees in 37 countries, revenue responsibility or not, I’d be traveling. The point of it is that I didn’t embrace his advice. Here was a credible source who knew me. So why didn’t I listen? Anna Fells’ offers a view through her assessment of ambition in Necessary Dreams, Novofemina’s Summer Book Review #8. In it she posits that recognition, a critical element of ambition, requires “appreciation by another person that feels accurate and meaningful to the recipient.” (Necessary Dreams, pg 9) So too advice I believe. Herminia Ibarra in Working Identity, Novofemina’s Summer Book Review #9, offered, albeit unwittingly, a sobering thought on advice. In her book she advocates for a series of experiments as the core element in productive change or transition. But she notes that barriers to change “can include our preconceived notions about viable work arrangements AND our existing connections like family members.” (Working Identity, pg 83) The advice we receive may come free of charge but with hard to see accoutrements. Can you identify biases, unintended or not? Did my friend’s technology lens blur his ability to offer me sound advice? I wonder the same thing about the budding entrepreneur and her industry feedback. I wonder how many retail executives told Jeff Bezos in 1999 that he was out of his mind? Amazon did $12.8 Billion in revenue in Q2 2012. My experience in HR was far from a pink graveyard. Post zinger friend got to the really tough question, ‘What do you want to do?’ My guess is that if we strip away the market feedback and the rationalizations…my entrepreneurial friend might just need to hear that question too. How about you? 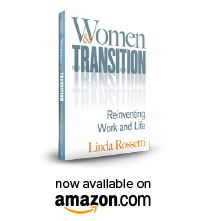 This entry was posted in Observations on Transition and tagged career transition, Herminia Ibarra, linda rossetti, Necessary Dreams, novofemina, observations from a women's transition, women's transition, women's transition issues, Working Identity. Bookmark the permalink.